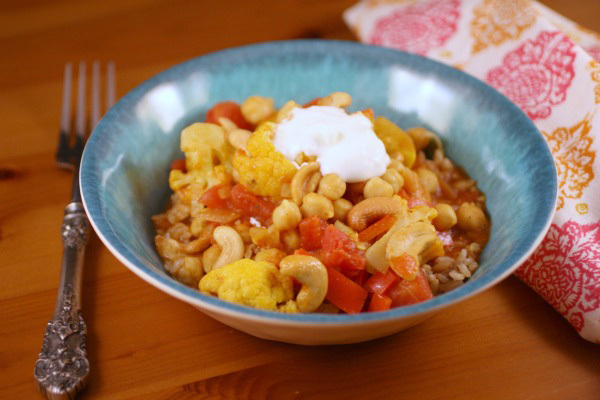 Meatless Monday is a great day to serve vegetable and cashew curry. This dish is super-satisfying and makes a big impact on hungry diners! We love one-dish meals, especially when they have everything you need to make a wonderful Meatless Monday meal. Vegetable and cashew curry takes under 30 minutes to put together, and it’s hearty and teeming with flavor! Add the olive oil to a large saute pan over medium. When hot, add the cauliflower, red pepper, onion and curry powder. Cook for 2-3 minutes, stirring. Add the vegetable broth, garbanzo beans, tomatoes, turmeric, cayenne, salt and pepper. Bring the mixture to a boil, cover and reduce the heat. Cook for about 10 minutes. Just before the mixture is finished, add the cashews and mix. Serve hot over rice and garnish with Greek-style plain yogurt. Make a great Meatless Monday meal!